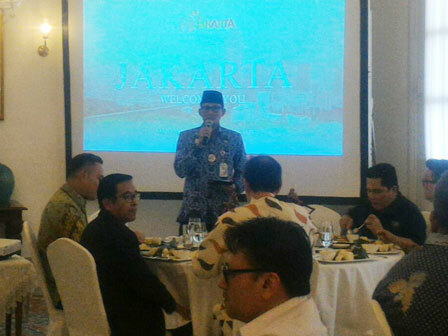 Jakarta Vice Governor, Sandiaga Uno asks all sponsors, like BUMN and private companies to participate in promoting Asian Games 2018 thus more people will know about this event.
" Mr. President asks us to intensify Asian Games promotion to boost up people's enthusiasm"
He added, Jakarta Provincial Government needs support from many sides, including sponsorship and Inasgoc thus Asian Games fever can be made in Jakarta. "Mr. President asks us to intensify Asian Games promotion to boost up people's enthusiasm. The city continues to do it," he said while having a luncheon with Inasgoc sponsorship at Fatahillah Room, City Hall, Wednesday (5/2). He added, enthusiasm towards Asian Games has been felt by most Jakartans. It is proven when his side has a visit and dialogue with local residents. "I ask them about Asian Games, and it turns out many people have known it," he expressed. Besides, the city and Inasgoc also want Asian Games to boost people's economy. "Thus the city and Inasgoc will hold an event which is involving UKM actors," he conveyed.